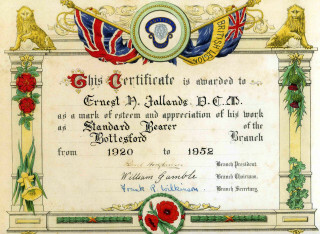 Ernest Jallands' attestation record from Artillery Records. The official citation issued during the award of the DCM to Herbert Jallands. Armistice Day in the 1920/30s: Cecil Briggs, Ernest Jallands (Standard Bearer) and Jack Asher. Ernest Jallands DCM is remembered on the Bottesford Methodist Chapel’s Roll of Honour, and is one of the men on the Bottesford ‘church list’ of WW1 Servicemen. 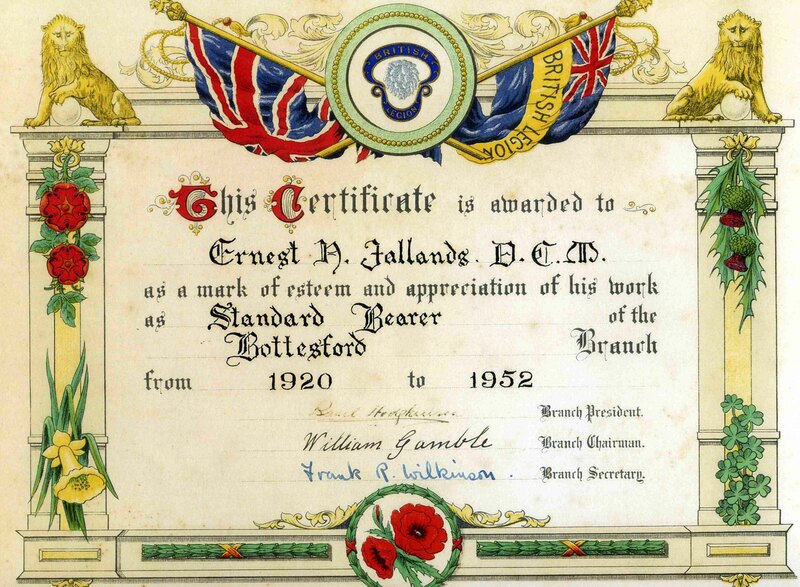 Ernest Henry Jallands was born in Bottesford on the 13th March, 1893, and baptised on the 1st October, 1894. He was the second son of Joseph and Emma Jallands. His father was born in 1860 at Dunston, Lincolnshire, and his mother (nee Asher, then Ward) in 1859 in Bottesford. Emma and Joseph married in 1886. They lived In Bottesford at 6 Mill Lane (1891 census) then at 6 Muston Road (1901 census), moving next door to 5 Muston Road by the time of the 1911 census. Before 1911, their name was recorded as ‘Jalland’ not ‘Jallands’. In 1891, Joseph described himself as an agricultural labourer, in 1901 as a ‘horseman on farm’ and in 1911 as a waggoner. The family would have grown up with working horses. The children of Joseph and Emma were Walter, Sarah, Annie, Ernest, Herbert, Edith Emily, Cecil Henry, Ida Ellen, Albert and Hilda. In 1911, as well as supporting their step-children, Joseph and Emma were also looking after their grandson Cecil Henry (age 2) and 1 month old granddaughter, Ida Ellen. However, by this date Ernest had left home and aged 18 was working as a waggoner for Mr Withers at Cockitt Farm, Farnsfield, Southwell, and was lodging with the farmer’s housekeeper, Mary Campion, along with Thomas Cross, the farm bailiff, another boarder. Unfortunately Ernest’s full service record has not survived however medal records and reports of his service have been found, and also his Artillery Attestation record. The latter indicates that he first attested as early as 29 May 1911 and again on the 28 May 1914, before his final attestation to join the forces on the 5th August 1914. 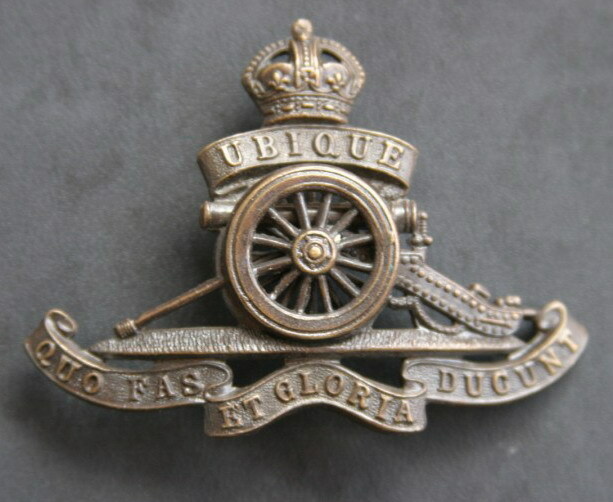 Before the war Ernest was in the Territorial 5th Reserve Brigade, Royal Field Artillery. According to his medal record card he was a Driver no. 65251 and he was promoted to Sergeant on 23rd August 1914, the date of his embarkation for France. In France his service was with the 14th Brigade, Royal Field Artillery. 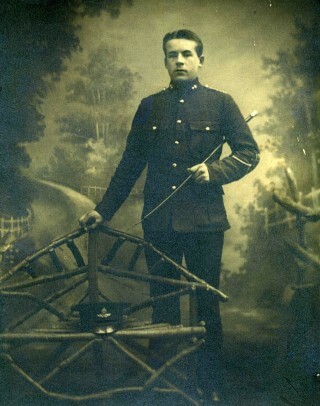 He served in France from 1914 to 1918. On the 19th March, 1915, he was awarded the Russian 3rd Class Medal of St George, then on the 19th June, 1915, he received the Distinguished Conduct Medal (DCM). 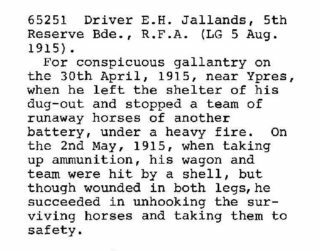 The citation for his DCM states that it was awarded for conspicuous gallantry on 30th April 1915, near Ypres, when he left the shelter of his dugout and stopped a team of runaway horses of another battery under heavy fire. 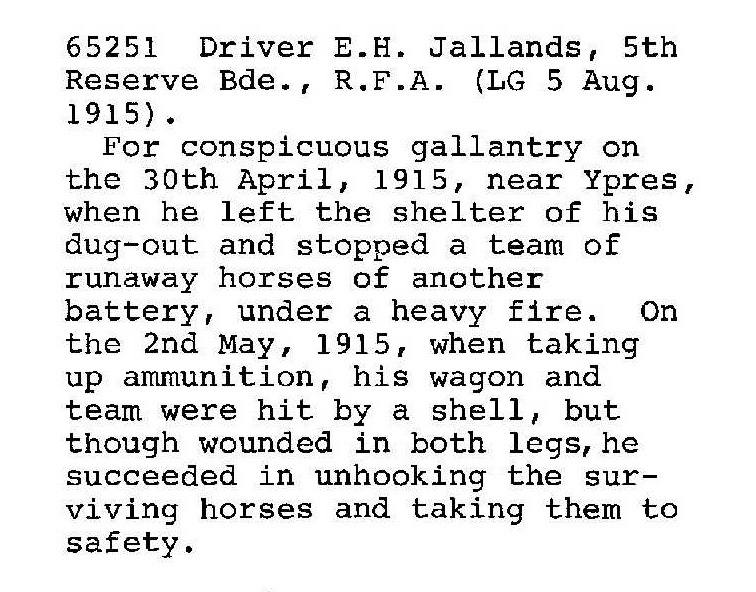 On the 2nd May, 1915, when taking up ammunition, his wagon and team were hit by a shell. Though wounded in both legs, he succeeded in unhooking the surviving horses and taking them to safety. He was subsequently treated for his injuries at the Red Cross Hospital Salford, Manchester. The Grantham Journal reported on a letter he had sent home from hospital, where he described the shelling, which had started at 3.30 a.m. He commented that the Germans had attacked with gas at 5 p.m. after which he was injured in both legs, particularly his left thigh. Please follow this link for a detailed account these events. Ernest is remembered on the Bottesford Methodist Chapel’s Roll of Honour. In addition to the Distinguished Conduct Medal and Russian Decoration of the Cross of St George (3rd class), he received the 1914-15 Star, the Victory Medal and the British War Medal. Ernest married Mabel Hand, from Barkestone-le-Vale, in Bingham on the 29th August, 1916. 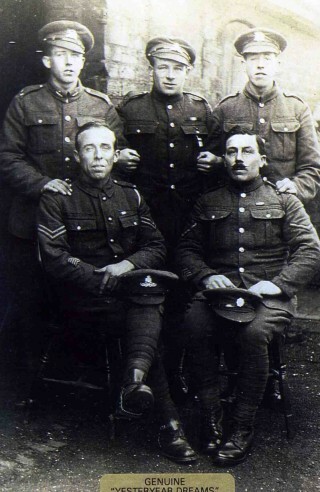 They had three sons and a daughter – Albert, Bernard, Ernest and Eileen (now Waudby). The electoral rolls record that during the 1920s, Mabel and Annie Jallands lived in Easthorpe. Ernest was not on the electoral roll in the first part of the decade, but by 1926 we find Ernest Henry and Mabel, and also Joseph, Emma and Annie Jallands, in Easthorpe. Joseph and Emma were Ernest’s parents, but the identification of ‘Annie’, later recorded as ‘Annie Elizabeth’, is uncertain at the moment . In the 1939 register, Ernest (a government contractor’s labourer) and Mabel were recorded living at Easthorpe. With them were Ernest W. Jallands, a plumber’s labourer born 19th March, 1915, and Bernard L. Jallands, a baker’s roundsman born 19th August, 1922. 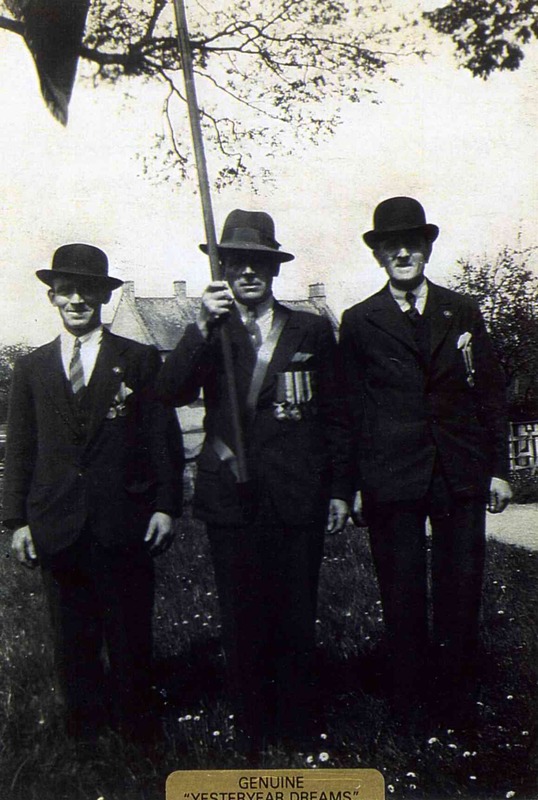 He was very active in the Bottesford Branch of the British Legion and acted as a legion standard bearer and guard of honour at funerals of ex-servicemen, for example at the funeral of Mr J. Asher. In World War 2, Ernest Jallands, DCM enlisted with Major Wright of Bottesford and joined a contingent of British legion members who set sail for Poland. However, the German Army moved swiftly into that country, dive-bombing along the Polish Corridor. This along with other factors quickly called for the project to be abandoned. Returning home Mr Jallands, due to age and disability, worked in an armament factory for the duration of the war. In the early years of the 2nd World War, it was a requirement for all men to join an auxiliary service, e.g., Home Guard, Fire Watch, First Aid and the Observer Corps. Mr Jallands enlisted in the latter, their duty post being a wood hut and raised platform on the top of Palmer’s Hill off the Normanton Road. Their objective was to keep a look out in the night sky, listen and try to locate enemy aircraft in flight by engine sound or silhouette, and to estimate type, speed, numbers and flight path. This information was relayed by telephone to a national data centre. Mr Jallands duty roster being four hours each night two nights a week. This was in addition to his work in the armament factory. His wife, Mabel Jallands, worked on the local farms in fields around Easthorpe for the duration of the war. Although Ernest’s mobility was affected by the wounds he received in the legs and feet, he was a keen gardener and highly respected in that field. He earned his living as a gardener in the years between the two great wars as well as working relentlessly for the British Legion. After WW2, he worked as a storeman in Bill Roberts’ builders yard during the last years of his life. George Waudby described him as a thoughtful, kind and private man, a father in law and a friend. Ernest Jallands died on the 10th April, 1963, aged 70. His wife Mabel, of Muston Lane, Easthorpe, was granted probate with effects of £1303 5s. She died in 1980, aged 88. Ernest was one of four brothers and a fifth half-brother who all served in the First World War and who all came home as survivors.